Our Breast Collar is very flexible and adjustable, and will fit a wide range of equines! Waffle padding options coming soon. Scroll down and see more options below! 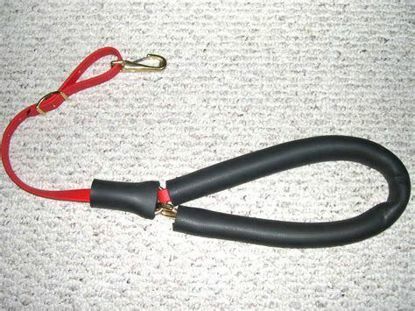 This Crupper is made of soft neoprene around a beta biothane strap. The neoprene won`t rub the soft skin under your horses tail. The beta biothane strap from the ring to the saddle is flexible and easily adjustable. You can choose from black, brown, blue (royal), lime green, red, yellow, pink, violet, wine, pastel green, pastel purple, or saddle brown beta biothane and solid brass, nickel plated or stainless steel hardware ($3 upcharge for this expensive metal/hardware). Shown here in Red Beta with Solid Brass hardware. 100% mohair girths are ideal for distance and trail riders. They are flexible in all dimensions so very comfortable for the horse. Mohair is soft and breathable, and unlikely to gall. The Endurance style features a contoured shape and wider belly, which contributes towards better weight distribution. These girths have Stainless Steel roller buckles (accommodates 1" billets) backed by neoprene and leather (leather is against the horse), billet keepers and Stainless Steel center D-Rings for attaching a breast collar. Girths are made by Stillwater Cinch Company in Montana. Please specify an end-of-buckle to end-of-buckle length in the "Your specifications/measurements" box (in even 2" increments). 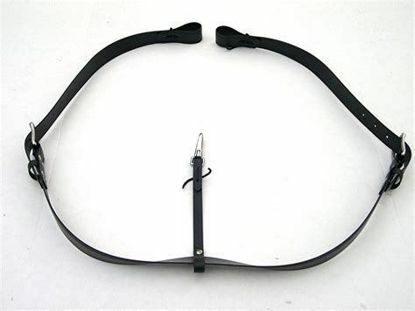 We stock girth lengths of 24" through 30". (Please note 26", 28" and 30") girths are currently on order.) All other lengths can be ordered. Girth lengths of 40" or longer cost at least an additional $10.00. Please contact us directly for these custom girths. 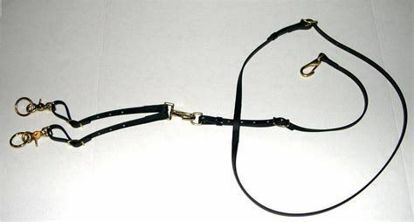 The Running Martingale with removable fork is great if you sometimes ride with a Breast Collar and don`t want all the extra gear around your horse. Just detach the fork from the Dee and snap onto the center ring of your breast collar. It does come with a lot of adjustability as the position of the attachment points are different. The connection to the reins is also set up for quick disconnects without having to thread and unthread your reins through the rings. Use on any Western saddle. Constructed of heavy duty leather-look Granite Biothane. 1 1/2" cinch and billets. Cinch connector strap (11") included. Shown here is a 38" cinch with 24" billets with Stainless Steel hardware. Please specify cinch length in the "custom measurements" box below.